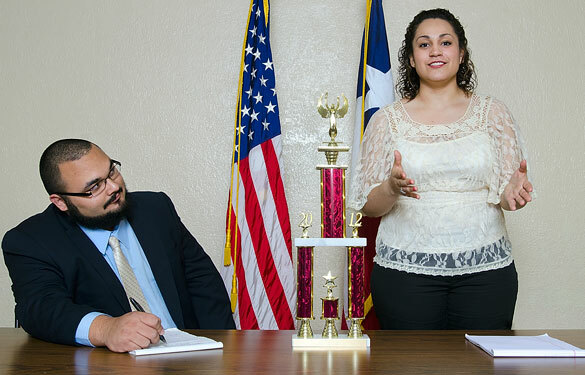 When doctoral student Adam Key decided to reestablish Sam Houston State University’s debate team after a four-year absence, he went to an unlikely source. Through the non-traditional method, Key and his team found non-traditional results, winning eight national titles since the team’s rebirth and a lot of academic respect. After traveling internationally and taking more spots in the nation’s list of top 10 debaters than any other school, SHSU’s debaters will show off their skills on their home turf, hosting the first national tournament on the SHSU campus in April. Among the debaters, Tim Sears, Cody Stevens, and Steven Perry are in the top 10 in “varsity division,” and Steve Sears is ranked No. 1. In the “professional division,” Jeremy Coffman, Robert Trevino and Key are ranked in the top 10. 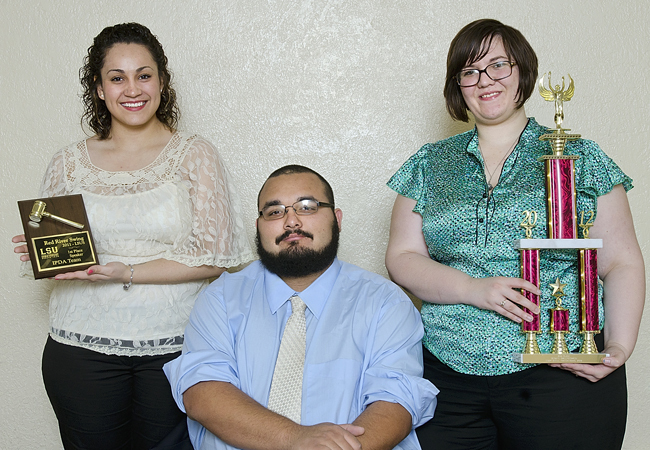 SHSU’s “team division,” in which Fabiola Sanchez and Stacy Hood debate as a pair, is also first in the nation. In academic debates, topics can range from pop culture to economics or politics. Teams are given 30 minutes to prepare, so during practice, Key gives them only 15 to prepare them for the pressure of a tournament. Academic debates work like a courtroom trial. A team will either have the “affirmative” or prosecutorial burden of providing proof, or the “negative,” which is like the defense, according to Key. Each team will have opportunities throughout a tournament to be on both sides. Debaters are expected to handle all sorts of topics from all sorts of angles. They may be required to argue for something they don’t support. One year, Key’s team had to figure out a way to support a hypothetical withdrawal of AIDS research funding. It was the year of the earthquake in Haiti, and they used that as an example of another way the funds could be spent. The fresh perspective worked, and they won. The ability to think quickly and “outside of the box” is among the skills that debaters acquire through competition that are useful in the real world, according to de Castro said. Though the SHSU team is well seasoned, freshman debaters often come in with strongly defined political identities and have a hard time arguing another viewpoint. “By the time they leave, they can appreciate both sides of the fence,” Key said. While it is well known that the skills acquired through debate are useful to lawyers in a courtroom, or in politics, Key said that many of SHSU’s debaters have gone on to jobs in public service. SHSU’s team faces challenges outside of their debate forum, largely involving money. That the team is able to do so well on such a small budget and no full-time coach speaks very highly of the students’ skills, de Castro said. Traditionally, lawyers who have learned these skills and gone on to high-paying jobs will make donations to help their alma mater’s debate team carry on the tradition; since that isn’t the case with Sam, the budget is small, according to Key. “Teams with larger budgets can bring larger squads. Universities like Union and LSU-Shreveport often bring more than 20 or 25 students,” Key said. “It's hard for our team, who regularly travel as a group of 12, to compete with that. Larger budgets also enable us to afford to travel the day before, rather than leaving at 4 a.m., driving eight hours, and then competing the same day. De Castro added that most universities have a hired debate coach. De Castro said he is looking forward to attending Sam’s first national tournament to hear interesting topics discussed and enjoy the “fireworks” during the cross-examination portion. The debates will be held in many classrooms all over campus from April 12-15 in the Lee Drain Building, the College of Humanities and Social Sciences Building, and Academic Buildings I and IV. Debates will be open to the public. For more information on SHSU’s debate team, e-mail debate@shsu.edu.